Recent studies show that reactions inside micron-sized compartments (e.g., droplets, emulsions) can proceed at significantly accelerated rates and with different mechanisms compared to the same reactions in a macroscopic container. Many of these studies use electrospray ionization (ESI) to both generate droplets and to quantify, via mass spectrometry (MS), droplet reaction kinetics. The highly charged and rapidly evaporating droplets produced in ESI make it difficult to examine precisely the underlying cause for droplet-induced rate enhancements. 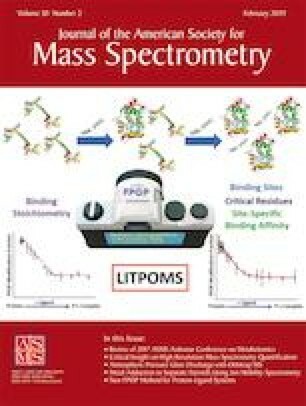 Additionally, interpretation of the spectra from ESI-MS can be complicated by gas-phase ion-molecule and clustering reactions. 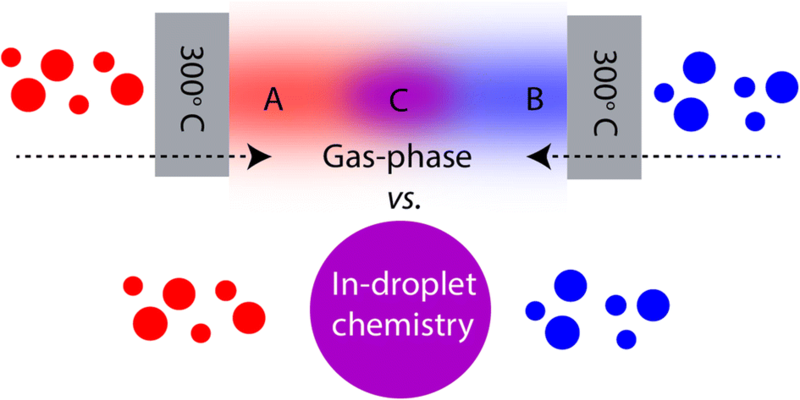 Here, we use an approach where droplet generation is separated from ionization, in order to decouple the multiple possible sources of acceleration and to examine more closely the potential role of gas-phase chemistry. The production of sugar phosphates from the reaction of phosphoric acid with simple sugars (a reaction that does not occur in bulk solution but has recently been reported to occur in droplets) is measured using this approach to compare reactivity in droplets (i.e., with compartments) with that in the gas phase (i.e., without compartments). The same product ions that have been previously assigned to in droplet reactions are observed with and without compartmentalization. These results suggest that in some cases, gas-phase processes in the ionization region can potentially complicate the quantification and interpretation of accelerated reactions in droplets using ESI-MS (or one of its variants). In such cases, contributions from in-droplet chemistry cannot be ruled out, but we demonstrate that gas-phase processes can be a significant (and possibly dominant) reaction pathway. We suggest that future studies of rate acceleration in droplets be modified to better assess the potential for non-droplet-related processes. The online version of this article ( https://doi.org/10.1007/s13361-018-2091-y) contains supplementary material, which is available to authorized users. This work is supported by the Condensed Phase and Interfacial Molecular Science Program, in the Chemical Sciences Geosciences and Biosciences Division of the Office of Basic Energy Sciences of the U.S. Department of Energy under Contract No. DE-AC02-05CH11231. M.I.J. is supported by a NSF Graduate Research Fellowship under DGE-1752814.